Sitar and tablas, ghatam and khanjira, mridangam and Carnatic violin blend seamlessly with muted trumpet and saxophones, screaming electric guitar and grooving electric bass lines, piano, upright bass and drums on this profound fusion of Indian classical and American jazz. 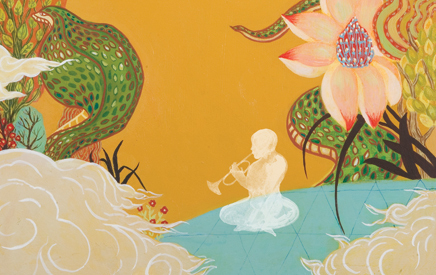 Recorded in Mumbai and Madras, India and New York, Chicago and Los Angeles, the music on Miles From India was performed by classical and jazz musicians from India with the addition of musicians who have recorded or performed with Miles Davis over the span of five decades. The Miles alumni included on the sessions are saxophonists Gary Bartz (1970-71) and Dave Liebman (1972-74). Guitarists include John McLaughlin (1969-72), Pete Cosey (1973-76) and Mike Stern (1981-84). Bassists Ron Carter (1963-69), Michael Henderson (1970-76), Marcus Miller (1981-1984) and Benny Rietveld (1987-91). Keyboardists Chick Corea (1968-72), Robert Irving III (1980-88) and Adam Holzman (1985-87). Drummers Jimmy Cobb (1958-63), Lenny White (1969), Leon ‘Ndugu’ Chancler (1971), Vince Wilburn (1981, 1984-1987) and tabla player Badal Roy (1972-3). The Indian contingent is represented by keyboardist Louiz Banks, drummer Gino Banks, American-born alto saxophonist Rudresh Mahanthappa, sitarist Ravi Chari, Vikku Vinayakram (a charter member of Shakti) on ghatam, V. Selvaganesh (a member of Shakti and Remember Shakti) on khanjira, U. Shrinivas (from Remember Shakti) on electric mandolin, Brij Narain on sarod, Dilshad Khan on sarangi, Sridhar Parthasarathy on mridangam, Ranjit Barot on drums, Taufiq Qureshi and A. Sivamani on percussion, Kala Ramnath on Carnatic violin, Rakesh Chaurasia on flute and Shankar Mahadevan & Sikkil Gurucharan on Indian classical vocals. With the Indian musicians first laying down the foundation of the tracks at studios in Mumbai and Madras, the Miles alumni then added on their parts back in the States. All the parts were then digitally edited into a coherent whole so that, for instance, on a tune like “Blue in Green” you get the sense of an organic, real-time call-and-response going on between Mike Stern’s keening guitar lines (recorded in New York) and Shankar Mahadevan’s impassioned vocals (recorded in Mumbai). 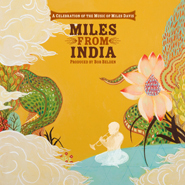 The lone commissioned work on “Miles From India” is the stirring title track, composed, produced and performed by guitarist John McLaughlin with his Remember Shakti bandmate U. Shrinivas on electric mandolin, Louiz Banks on piano and Sikkil Gurucharan on vocals.